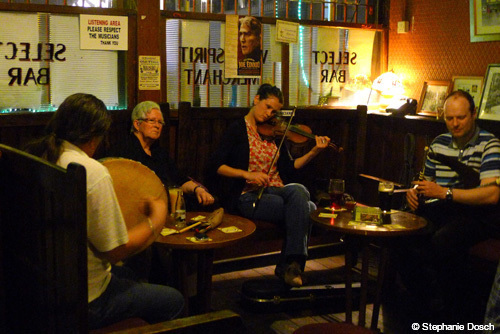 Experiencing pub culture is a quintessential experience when traveling in Ireland. Large or small, modern and elegant or centuries-old, these neighborhood bars serve as community living rooms, where friends and family gather to socialize or enjoy a hearty meal. We love that wherever we are in Ireland we can stop in a local pub, order a pint or a steak-and-Guinness pie, and easily interact with the locals. The Irish “gift of the gab” fosters many lively conversations. More often than not, neighbors bring instruments like flutes, bagpipes and bodhrans (Irish drums) and strike up impromptu traditional music sessions where all are encouraged to sing along. It’s a fun and memorable experience that reveals the true spirit of Irish culture. Our private Ireland tours can include visits to our favorite local pubs. Contact Artisans of Leisure to start planning today.